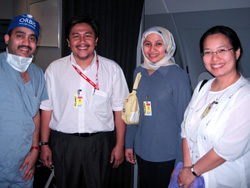 Sister Dina and staff from the Eye Department of Sarawak General Hospital touring ORBIS plane. Dr. Mahadhir (Left) and friends from West Malaysia. 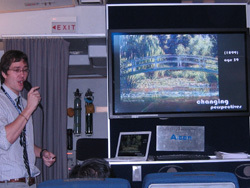 Dr. Lawrence showing fellow anaesthetists from Sarawak General Hospital. 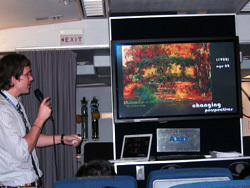 Dr. Fuller entertained the audience with a talk on Art and Ophthalmology while the patient was being prepared for operation. Monet's Japanese Bridge showing the effect of cataract. 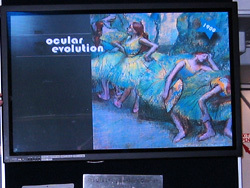 Edgar Degas and his visual problem. Anterior lamellar keratectomy with amniotic membrane graft. Right macular hole and cataract. Left proliferative DMR with vitreous haemorrhage.